According to the press release, “Hamaya focused inward toward rural life on the back coast of Japan, [while] Yamamoto found inspiration in the art of European Surrealists,” the two artists responding differently to upheaval in their country in two different ways. 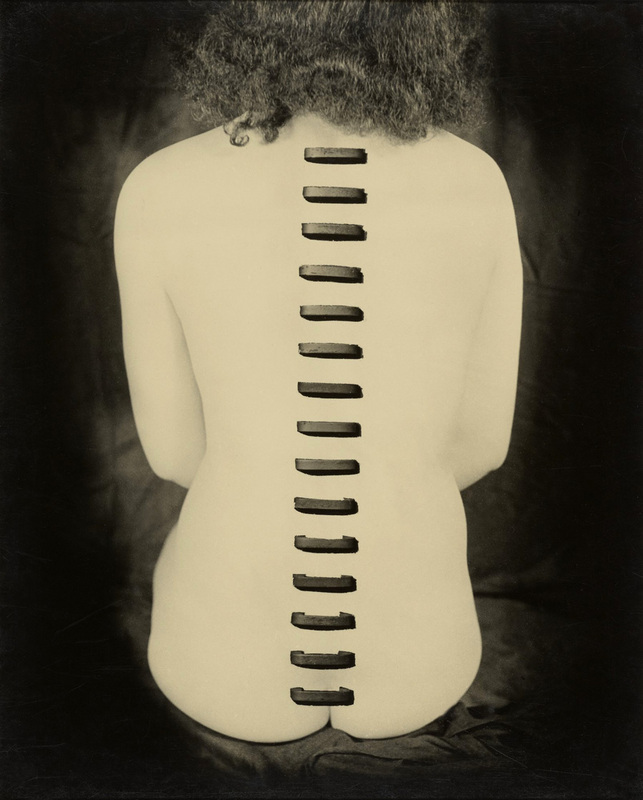 While Yamamoto is more obviously influenced by the Surrealists, almost becoming the Japanese version of Man Ray, for me Hamaya’s photographs are equally if more subtly influenced by the cultural movement. 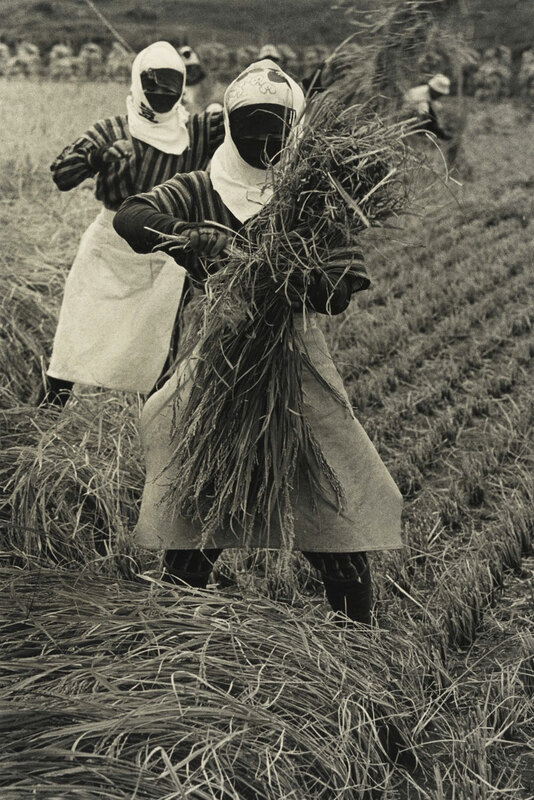 Observe Woman Planting Rice, Toyama Prefecture (1955, below). I relate this image to the atomisation of bodies during the conflagration of Hiroshima, however subconsciously the artist is expressing this feeling. 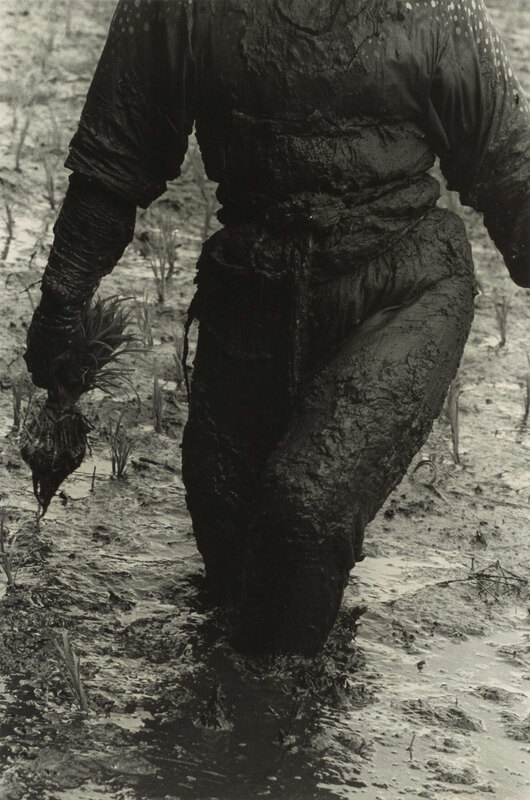 Similarly, the faceless humans in Rice Harvesting, Yamagata Prefecture (1955, below), blind musicians, disembodied man in a raincoat or poet thinking the void all have an essential quality, that of a disturbing psychological undertow which juxtaposes two more or less distant realities – reality and dream – to form images of great emotional and poetic power. Many thankx to the J. Paul Getty Museum, Getty Center for allowing me to publish the photographs in the posting. Please click on the photographs for a larger version of the image. In 1959 the proposed ten-year renewal of the United States-Japan Security Treaty of 1952 meant the continuation of the presence of U.S. troops and the persistence of U.S. political and cultural influence. 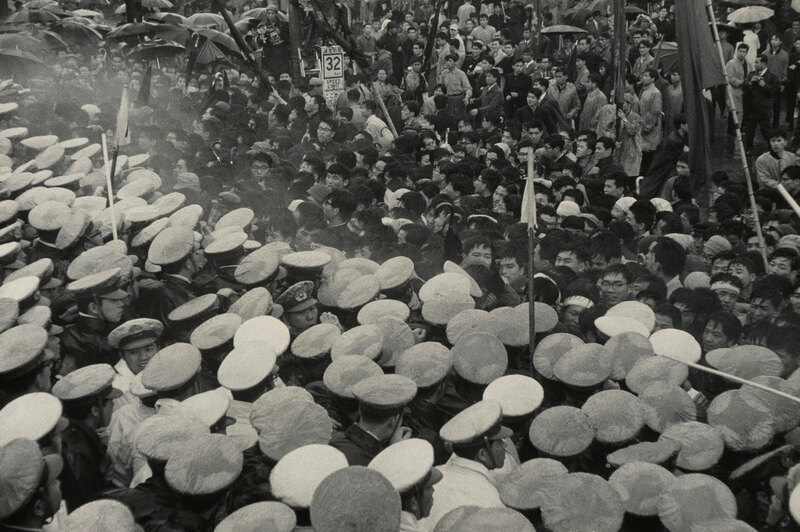 When Prime Minister Nobusuke Kishi, with the aid of the police, forced the Japanese parliament to ratify the treaty in May 1960, the public upheaval was immense. Hamaya, a pacifist living outside Tokyo, entered the fray with his camera, chronicling the demonstrations. His pictures were published both individually and in the form of a quickly assembled paperback under the title Ikari to kanashimi no kiroku (A Chronicle of Grief and Anger). Japanese society had a pronounced respect for artists, authors, craftsmen, and scholars. As a freelance photographer, Hamaya was often enlisted to make portraits of them for publication. He compiled a selection of these portraits made since the 1940s for the 1983 book Japanese Scholars and Artists, which included the renowned poet, art historian, and calligrapher Yaichi Aizu. Hamaya also produced a series of genre studies that featured his wife, Asa Hamaya, who was a skilled master of the tea ceremony. After her death in 1985 Hamaya prepared a memorial to her in the form of a portfolio of prints, titled Calendar Days of Asa Hamaya, following the earlier ukiyo-e tradition of woodblock series such as bijin-ga (pictures of beautiful women). The Taishō era (1912-1926) was a brief but dynamic period in Japan’s history that ushered in a modern state with increased industrialization, shifting political parties, radical fashions, and liberal thinking in many areas. However, this era of heightened experimentation ended with the arrival of an international depression, the promotion of ultranationalism, and the country’s entry into what would become the Greater East Asia War. Reflecting both sides of this dramatic transition, two disparate representations of modern Japan will be displayed together in Japan’s Modern Divide: The Photographs of Hiroshi Hamaya and Kansuke Yamamoto, on view March 26 – August 25, 2013, at the J. Paul Getty Museum, Getty Center. 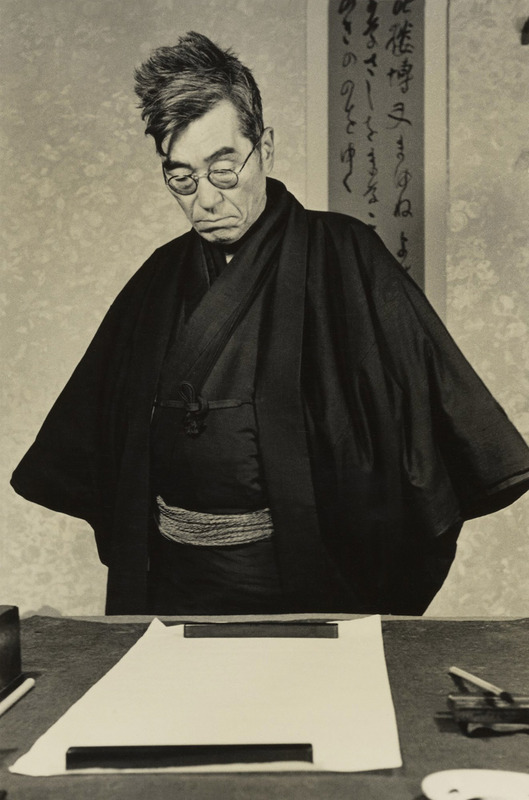 Curated by Judith Keller, senior curator of photographs, and Amanda Maddox, assistant curator of photographs, the exhibition includes photographs from the Getty Museum’s permanent collection, the Toyko Metropolitan Museum of Photography, the estate of Hiroshi Hamaya, the Nagoya City Art Museum, and other public and private lenders. 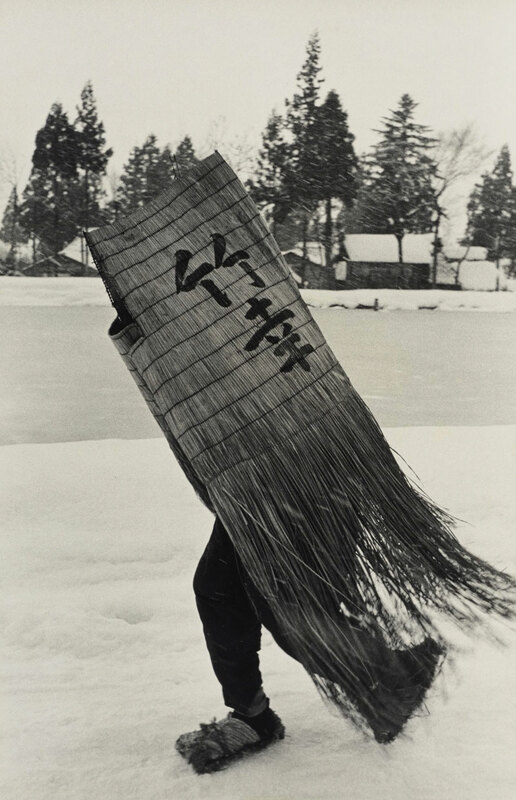 Born during the Taishō era, photographers Hiroshi Hamaya (1915-1999) and Kansuke Yamamoto (1914-1987) responded to Japan’s rapidly-changing sociopolitical climate in very different ways. While Hamaya focused inward toward rural life on the back coast of Japan, Yamamoto found inspiration in the art of European Surrealists. As the ebb and flow of Japan’s political, economic, and social structures persisted across the 20th century, Hamaya and Yamamoto continued to pursue divergent paths, thus embodying both sides of modern Japanese life: the traditional and the Western, the rural and the urban, the oriental and the occidental. The son of a detective, Hamaya grew up in Tokyo’s Ueno neighborhood during the rise and decline of the Taishō era. After attending Kanto Junior College, he began his photographic career by taking aerial images for the Practical Aeronautical Institute. He later photographed downtown Tokyo from street level, and provided images of daily city life and local events to a number of magazines. 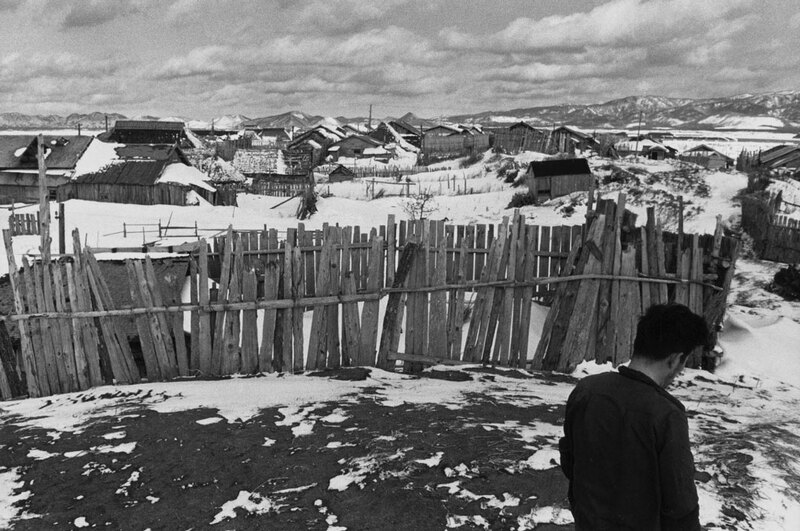 In 1939, an assignment that took him to Ura Nihon, or the rural back coast of the Sea of Japan, changed his view of photography and society. 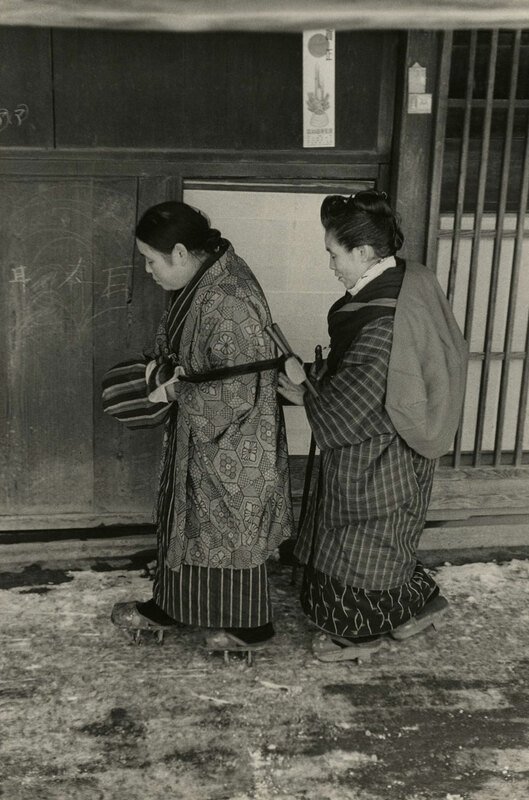 Known for its unforgiving winter snowstorms and the difficult lives of its impoverished inhabitants, Ura Nihon was a mystery to most of Japan and the world. Moved by the customs and lifestyles of a much older era, Hamaya shifted from journalism toward a more humanistic and ethnographic approach to photography, capturing the everyday life of the region’s residents. This included documenting laborers in fields and at sea, as fish and rice were the primary sources of nourishment throughout the year. From 1940 to 1955 Hamaya pursued a long-term personal interest in the region of Echigo (now known as Niigata Prefecture). He recorded the people, traditions, and landscape of a district that was, at the time, Japan’s chief rice-producing region in spite of a four-month long snow season. Among his many subjects, Hamaya focused on the winter in Kuwatoridani, a small agricultural village that practiced elaborate, long-standing New Year’s Eve rituals. 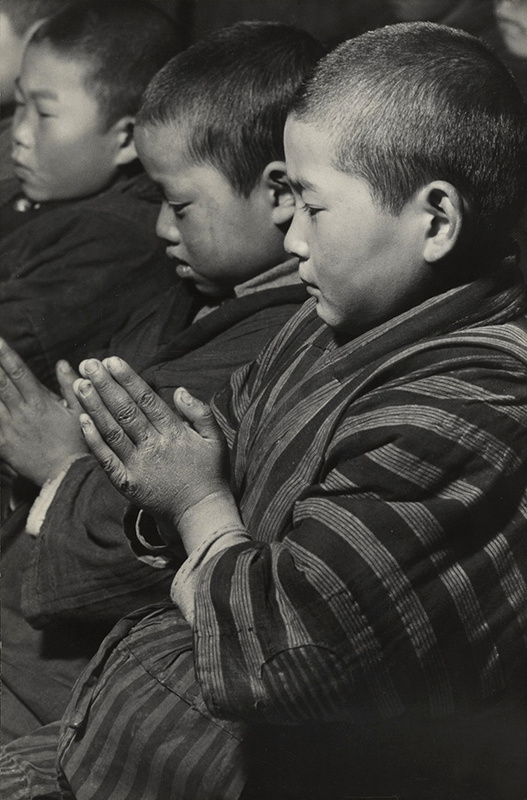 In New Year’s Ritual, Niigata Prefecture (1940-46), boys in the village are seated with their hands clasped and their eyes closed in prayer. The close-up of the boys’ faces in deep concentration emphasizes the respect for customs of the region. In late 1959, the proposed ten-year renewal of the United States-Japan Security Treaty of 1952 raised doubts about Japan’s sovereignty and its future prosperity. When Prime Minister Nobusuke Kishi, with the aid of police, forced the Japanese parliament to ratify the treaty in May 1960, the political upheaval was immense. While Hamaya was a pacifist, he felt obligated to return to his journalistic roots and entered the fray with his camera. He chronicled the demonstrations day by day, sometimes hour by hour. Hamaya’s career also included portraiture of noted artists and scholars. As a freelance photographer, he was often enlisted to make portraits of well-known men and women, and in 1983 published Japanese Scholars and Artists, a book that included prominent novelist Junichiro Tanizaki, woodcut artist Shiko Manakata, literary critic Kenichi Yoshida, and renowned poet, art historian, and calligrapher Yaichi Aizu. He also documented the daily life of his beloved wife, Asa, and upon her death in 1985 created a portfolio of these sensitive photographs, Calendar Days of Asa Hamaya. 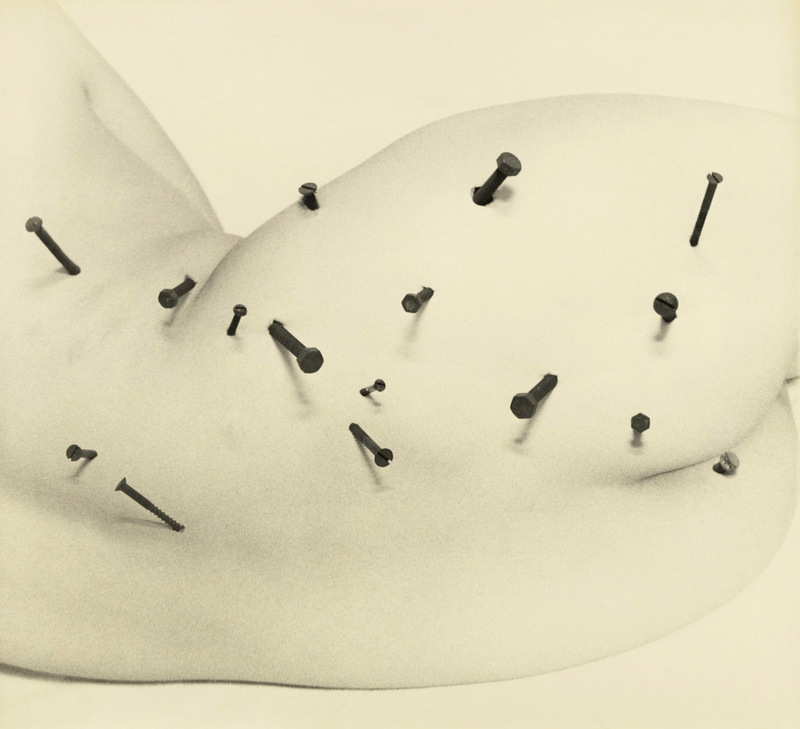 Kansuke Yamamoto (1914-1987) learned about photography from his father, an amateur pictorialist photographer and owner of the first photo supply store in the city of Nagoya. His interest in photography developed at a time when two movements based on experimentation and new modes of expression—Shinkō Shashin (New Photography) and Zen’ei Shashin (avant-garde photography) – were dominant. 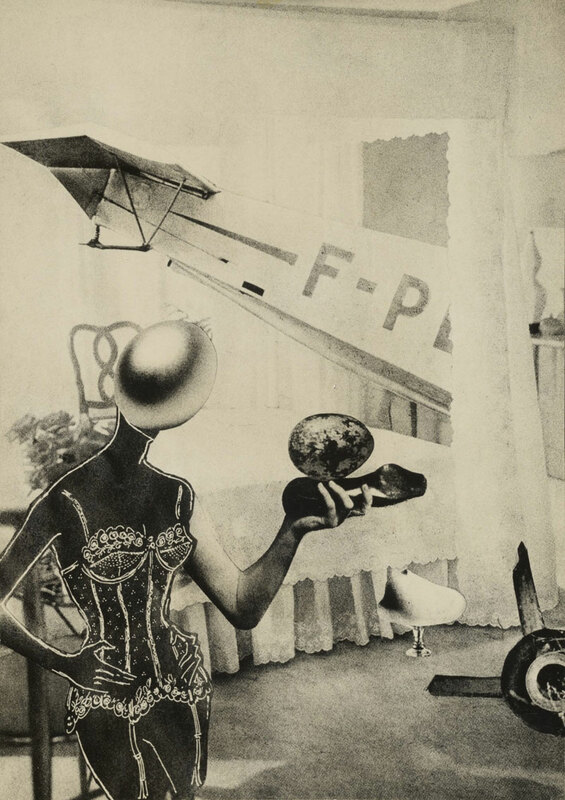 However, it was Surrealism – particularly Surrealist artists and writers such as René Magritte, Paul Éluard, Yves Tanguy, and Man Ray that appears to have made the most profound impact on his work. 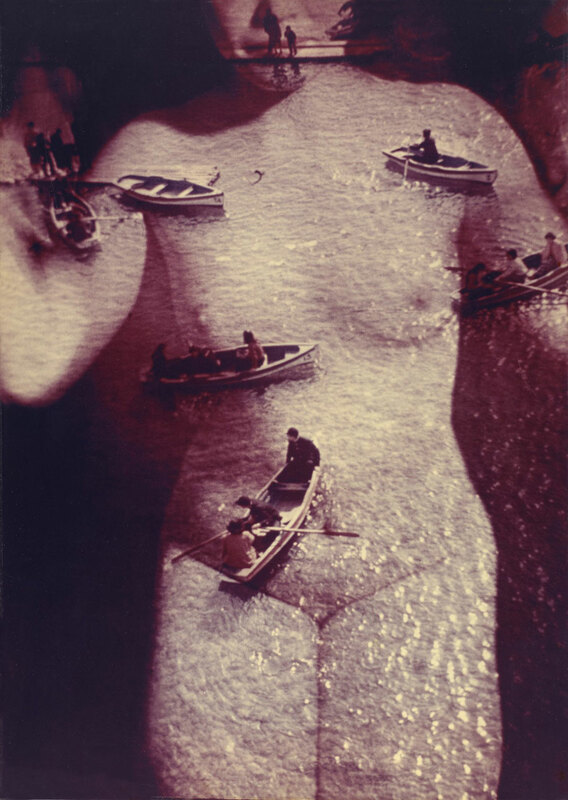 Yamamoto was an influential figure in the avant-garde photography movement in Japan in the 1930s, helping to establish the group Nagoya Foto Avant-Garde by the end of that decade. In 1938 he created a journal, Yoru no Funsui (The Night’s Fountain), which promoted Surrealist poems, literature, ideas, and art in Japanese. 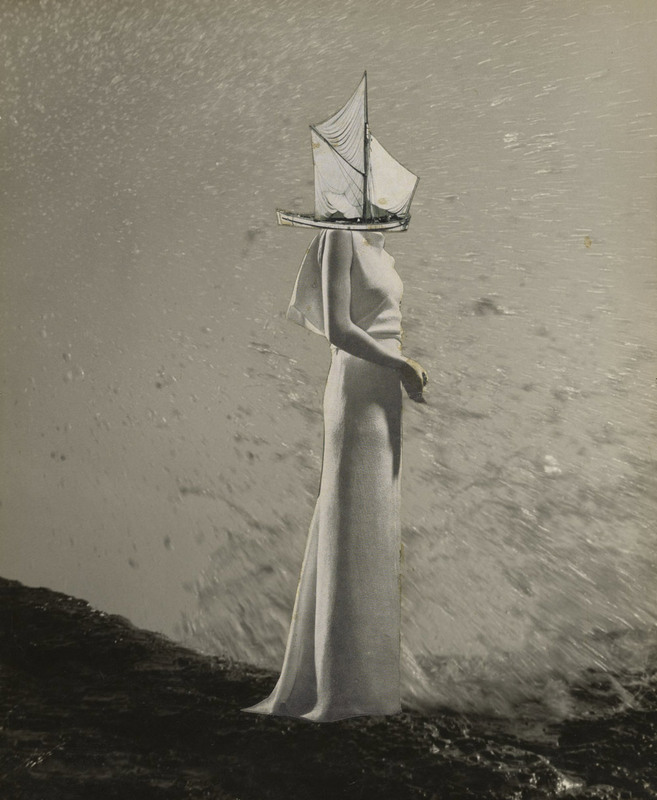 His first photographs date to the early 1930s and reveal an interest in myriad techniques and subjects, including abstract architectural studies, still life, and collage. From the outset, he created work suffused with mystery, provocation, and humor. 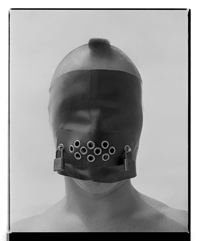 He often utilized photography as a means to address controversial issues or express avant-garde ideas. 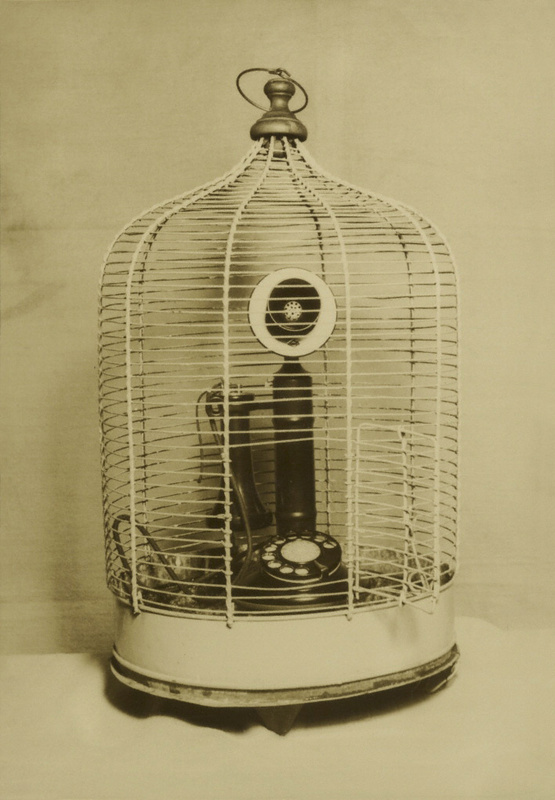 For example, in Buddhist Temple’s Birdcage (1940), the telephone enclosed in the cage is possibly a metaphor for the control exercised by the Japanese government during the Showa Era (1926-1989), a theme that reappears in work produced throughout his career. 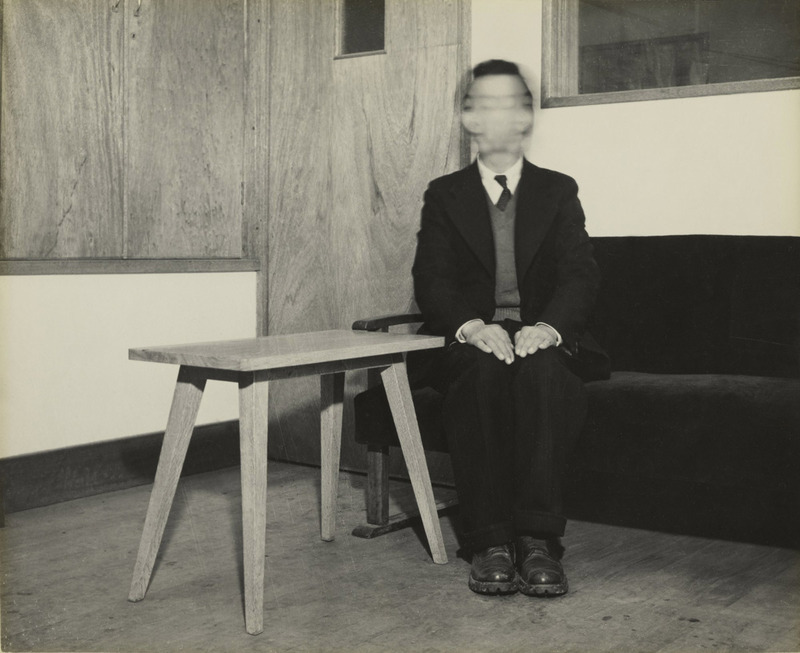 The experience of being interrogated by the Tokkō (Thought Police) in 1939 for his journal, Yoru no Funsui, and its potentially subversive content made a profound impact on Yamamoto, but never deterred his avant-garde spirit. Yamamoto remained part of the artistic vanguard in Japan during the 1940s and 1950s. He was a member of VOU, a club founded by poet Katue Kitasono that organized exhibitions and published a journal promoting visual “plastic” poetry, photography, literature, and other arts. In 1947 Yamamoto founded VIVI, a collective in Nagoya that allowed further dissemination and promotion of avant-garde ideologies. Yamamoto continued to produce innovative work during this period, experimenting with color photography, combination printing, photograms, and sculpture.